Engineered with optimized low resistance, high turns ratio windings around an M36 high silicone magnetic steel E-core for higher energy and voltage outputs. Results in quicker starts, improved idle quality, crisper throttle response and more high RPM power. 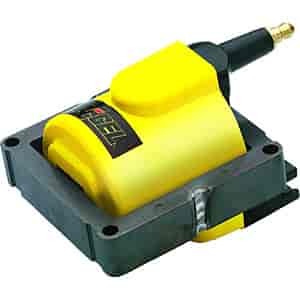 Compatible with late model Ford EEC-IV computer controlled ignition system equipped with a TFI distributor. Direct OEM replacement. Can also be used with an ACCEL, Mallory, Crane, Holley or MSD capacitive discharge ignition system. Special high temperature epoxy resists shock and vibration, while increasing thermal conductivity. Brass coil wire contact increases energy efficiency and resists corrosion better than aluminum. High dielectric strength ACCEL Yellow over-molded housing. Does Accel 140012 fit your vehicle? 140012 is rated 5.0 out of 5 by 1. Rated 5 out of 5 by BBQnut from Accel products ROCK!! Bought this for my 1996 Ford F-150 and it was shipped fast and installed quick to make the tune up complete!! Works great would recommend to anyone with an older truck! !